I hemmed and hawed as to whether or not include both of the dressings for this salad. And, after experimentation, I concluded that both are necessary! I know, not very minimalist to have two dressings for one salad, but the flavor combination is incredible and we still stay within the 30-minute limit! 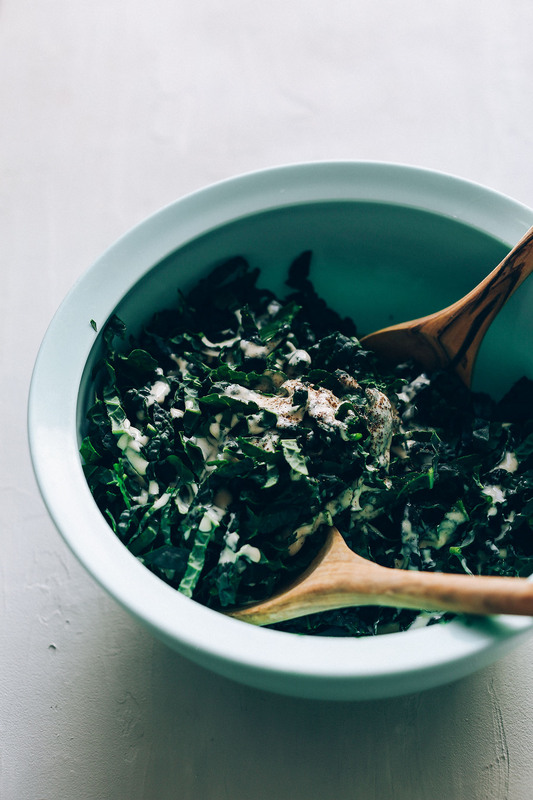 The base of this salad is crunchy kale dressed in a light tahini-lemon-maple dressing. Next comes cooked lentils for plenty of plant-based protein and fiber. While that’s happening, vegetables tossed in curry powder are roasted away to perfection and my NEW favorite dressing is made. The base is my Green Curry Paste thinned with lemon juice and sweetened with maple syrup. The result is a tangy, sweet, insanely vibrant curry dressing that’s perfect for everything – especially this salad. This is the perfect salad to have midday or as a quick weeknight dinner. It keeps incredibly well, which makes it perfect for leftovers the next day (hello, best packed lunch ever). Looking for more curry recipes? 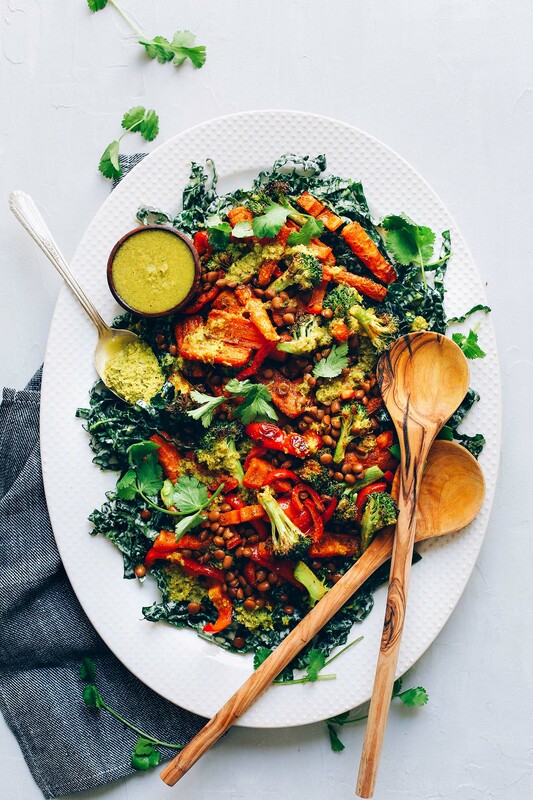 Check out our Vibrant Green Curry, 30-Minute Curried Coconut Greens, Spicy Red Lentil Curry, 1-Pot Lentil Dal, and 1-Pot Sweet Potato Kale Curry! If you try this recipe, let us know! Leave a comment, rate it, and tag a photo #minimalistbaker on Instagram. Cheers, friends! 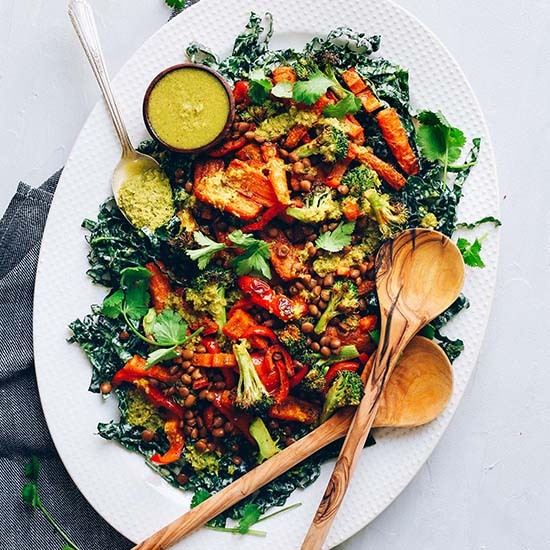 A hearty, intensely flavorful kale salad with roasted curried vegetables, lentils, and a tangy, spicy green curry dressing. Just 30 minutes required! Preheat oven to 375 degrees F (190 C) and line a large baking sheet with parchment paper (or more baking sheets if increasing batch size). Add carrots to a small mixing bowl with drizzle with half of the oil (1 Tbsp or 15 ml), a pinch each salt and pepper, and 1/2 tsp curry powder (amounts as original recipe is written // adjust if altering batch size). Toss to combine. Then arrange on the baking sheet. Roast for 12 minutes. In the meantime, add bell pepper and broccoli to the same mixing bowl and drizzle with remaining 1 Tbsp oil, salt, pepper, and 1/2 tsp curry powder (amounts as original recipe is written // adjust if altering batch size). Toss to combine. Once the carrots reach the 12-minute mark, remove from the oven and increase heat to 400 degrees F (204 C). Add the peppers and broccoli to the pan. Then roast for 10-15 minutes more or until all vegetables are tender and slightly golden brown. In the meantime, add the kale to a large mixing bowl. In a separate small mixing bowl, add the tahini, lemon juice, maple syrup, and apple cider vinegar and whisk to combine. Thin with water 1 Tbsp (15 ml) at a time until thin and pourable. Pour dressing over the kale and massage with hands or tongs / serving spoons. Spread the kale over a serving platter or keep in mixing bowl for serving. Top with lentils and set aside. To make the curry dressing, use the same small mixing bowl from the tahini sauce and add the curry paste, lemon juice, maple syrup, salt, pepper, and oil (optional). Whisk to combine. Then add water until thin and pourable (see photo). Taste and adjust flavor as needed, adding more lemon juice for acidity, curry paste for intense curry flavor, salt for saltiness, or maple syrup for sweetness. Set aside. 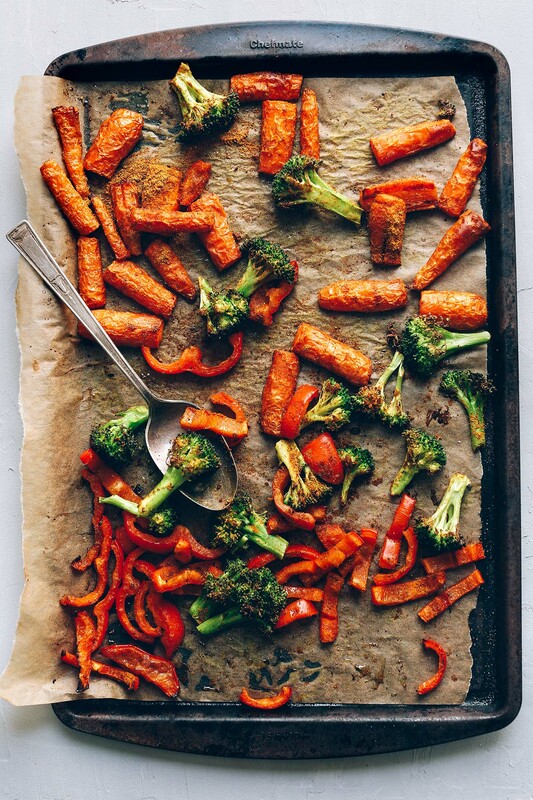 Remove roasted vegetables from the oven and add to the salad and lentils. Top with half of the curry dressing and serve with the remaining curry dressing. Garnish with fresh cilantro (optional). Enjoy immediately. Store leftovers in the refrigerator up to 3-4 days, though best when fresh. *To keep this recipe simple, I used canned lentils which I rinsed and drained. But you could also opt to make your own - it just increases cooking time a bit. *Nutrition information is a rough estimate calculated with all of the dressing and sauce but without the additional olive oil in the curry dressing. I had all the ingredients on hand to make this salad but realized I was short on kale once I was elbow deep in preparation. I ended up adding rice noodles to make up the difference . It was delicious and a satisfying dinner for 4. Even the kids loved it! There were a lot of steps but I was able to get dinner on the table within an hour. I have to say the original recipe is awesome. I’ve made just the dressings and used on other meals, too. In fact, tonight I just wanted to share that I am using roasted veggies with brown rice and tofu drizzled with the green chili dressing wrapped in nori sheets like green burritos. I like to roast a couple pans of veggies on the weekend to use all week for meals and I usually just reheat in the oven with whatever strikes my fancy (or is hanging around and must be used). Tonight is nori burritos! Prob the best salad I’ve ever had. So good it would make a tadpole smack a whale… as we say on the south. This was absolutely delicious! It was gorgeous and colorful, but also super yummy to eat. I want to put the curry dressing on everything from now on. Totally hadn’t thought to use curry paste in that way but wow was it good! I just made this salad for my family for lunch, and it was delicious! I didn’t have broccoli in the fridge so I substituted it for a large green zucchini. I also did not have enough lemon juice for the dressing, but it was so flavourful, even without it. Looking forward to making this recipe again soon, but this time with the right ingredients! This salad is Amazing! Warm summer night outside listening to the birds evening song, and swooning over this feast of a salad. I added a gold beet to the carrots roasting, and passed all the curry dressing rather than partial dress for those of us that are more cautious about spicy food. This is a company- worthy entree for a casual warm weather dinner. I served it with corn on the cob. Beautiful!!! This might be the best written review, Carol! We are so glad you enjoyed this salad! So good, I especially love the tahini dressing! Gonna add sweet potato next time. Great recipe! Oh my WORD!! This was flipping AMAZING. So easy and quick to rustle together and looked and tasted GORGEOUS. This recipe was delicious! It definitely had some heat to it! I was apprehensive in how all the flavours would come together but I was not disappointed, the combined flavours were delicious together. And I loved the lentils mixed with kale. I give it thumbs ups and 4 stars? Do you think one could substitute arugula for the kale? Yes, but we’d probably recommend collard greens or chard first! Thanks- we live in St Croix and fresh produce is not always available! So! Freaking! Good!! I made this because I was craving salad, but it’s below freezing outside. This was perfect! So filling, so flavorful, and so easy to whip up! This will be a new staple in my recipe rotation for sure!! Thank you for this recipe! I made it tonight, and it was really delicious! I added butternut squash too, which was really yummy! this is one of my favorite minimalist baker recipe! such insanely good flavors together – i can see why there are more than one sauce included in this — it totally elevates it a whole new level. i would suggest buying canned lentils or vacuum packed. I do find this recipe has a lot of steps if you’re making the green curry yourself but I feel like it’s more worth it to make her green curry and then just to go easy on dishes and steps, pre-made lentils would make it a tad simpler. so so so good! Wow, so many flavors and textures – a delight for the tastebuds and the body. Good recipe!! Fairly complicated with lots of ingredients…not really a “minimalistic” recipe…but very tasty indeed! I’ve made this for dinner twice in a row this week. It’s safe to say IM OBSESSED. The boyfriend loved it too, but he added grilled chicken to his salad — I topped mine off with some avocado and a glass of rosé. Thank you!! You’re right, the two dressings really make the salad . Wish I could add photos of the finished product in the comments! This was AMAZING! I made it for dinner tonight and it was a huge hit– even with some picky eaters! The flavor combination of the two dressings was perfect. I added in some yams with my vegetables, which worked well. I also used a mix of kale, spinach, and spring greens. This was a great and FILLING recipe. I will make this the next time I need to bring something to a potluck! This recipe was to die for. Made a nice big batch so good for a group and leftovers! Thank you for sharing, was a hit! Thank you for all of your recipes, I love your blog! We made it tonight! Absolutely delicious! This salad looks so colorful and abundant with flavors! Could you use any vegetables to substitute? Hi Cassie! Yes, feel free to switch up the vegetables for your favorites! I made this tonight and it was delicious! I skipped the maple syrup because I’m on a strict no sugar diet, and it was still excellent. I used the Thai Kitchen vegan green curry paste and that worked well. I can’t wait to eat the leftovers for lunch tomorrow. The curried veggies on their own have me inspired for other dishes. I would also double the curried veggies next time. YUM! This was DELICIOUS!!!! It made 3 meals for me as I was generous with the portions. The recipe is correct in saying best when fresh but it was still totally edible a couple of days after (just a little soggier). 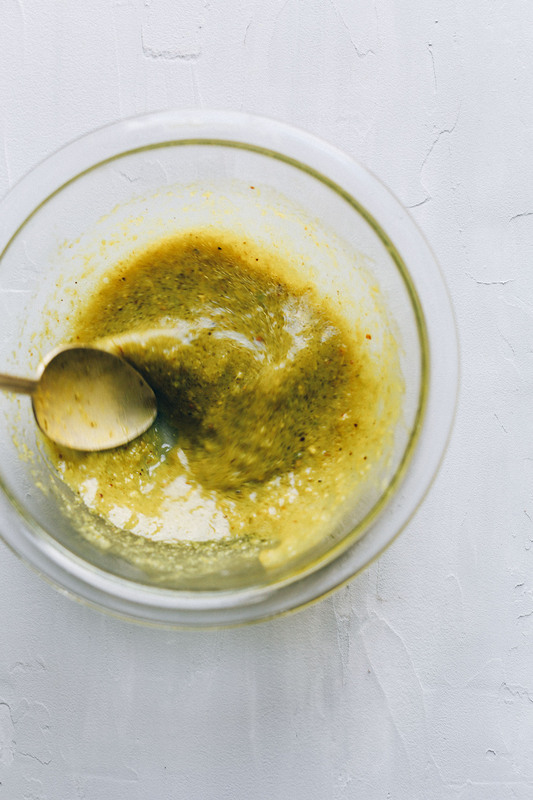 The green curry dressing that goes on top is AMAZING and i’ll be whipping it up just to have on hand – would be amazing on sweet potato hash and poached eggs. Very good recipe! So great – thanks for sharing!! I made this last night for dinner and it was a hit. My two year old loved the roasted curry veggies. When I make this again I think I’ll double the amount of roasted veg. My husband and I thought it could use a little crunch on top, maybe some toasted coconut? Keep coming with the entree salad recipes please! Toasted coconut sounds like a delicious addition! I made this last night and just wanted to come and say how delicious it is. I had some leftover sweet potatoes that I roasted in addition to the carrots, broccoli and red pepper. The dressing and sauce are incredible. I made large batches of the sauce/dressing and have plenty of more vegetables for roasting later this week. This may be to be a staple meal of mine this summer. Keep doing your thing! This sounds absolutely amazing. I love the idea of the green curry dressing. It seems like it can be used on so many different things. Thanks for the wonderful recipe! Wow! I made this for my family tonight and it was a huge hit! Even my husband who does not like salad loved it! I’m fairly new to your blog and just want to say thank you! I look forward to trying many more recipes! Dana, this really was the salad of our dreams! It was SOO good! The tang of the green curry dressing with the tahini dressing was spot on. Thanks for another great meal! Mmmm…yummy! And I love all the colors. I doubt I’ll get around to making the green curry paste on my own and if we buy it I’m sure it will be too spicy for us. Is there something we can substitute for the the green curry paste? Because the recipe looks delish! I had nearly all the ingredients on hand, so after a quick run to the store I made this tonight. I LOVE the flavor combos (as did my boyfirned). I have a lot of leftover dressing, I’ll probably remake this tomorrow! Thanks Dana! Could I make the green curry paste without garlic or onion? Thanks for the recipe–it looks stellar! Hmm I’m not quite sure, Soumya. If you try it, let us know how it goes! I love salads that are hearty enough to be a complete meal! Especially if there is tahini involved!! Ok yes to all of this! Mouth is watering. This was unreal! I made it tonight and it was a BIG hit. Yes on the two dressings; I am certain I will use them with other dishes. I served this with some sprouted coconut rice on the side. I will absolutely make this again! Holy cow that looks good – no wonder you’re sharing it with us. It all looks so “alive”! I love the idea of this, but unlike some of your other recipes, it looks like a lot of work and while I’m one to savor my meditative space of chopping vegetables with classical music playing in the background, it seems like this may take more than 30 minutes with the various sauces, baking and chopping. It does look fantastic. Hello, I made this for dinner tonight. It was like a beautiful flavour explosion! I had a jar of green curry paste in my fridge, but it really did only take 30 minutes to put together. Give it a try ;) . This salad is the dream, indeed. I like your style with the TWO dressings; cant ever get enough on all those veggie! This is EXACTLY what I want for supper tonight. 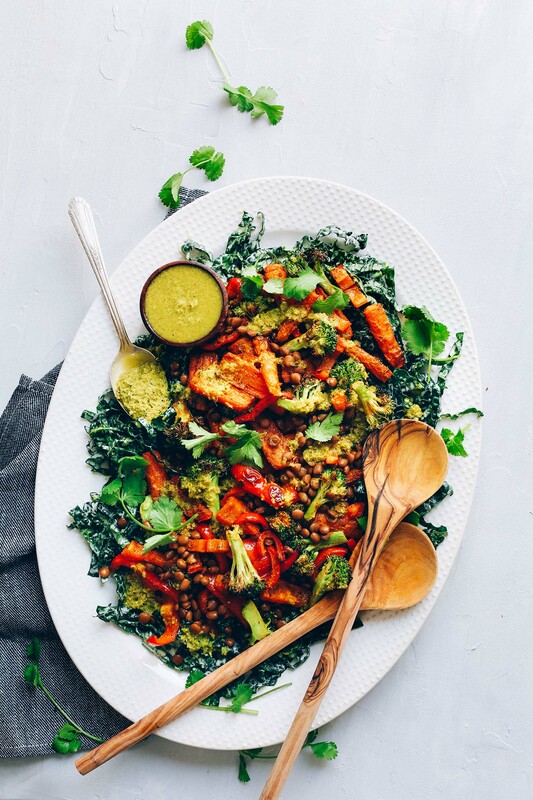 A hearty plant based salad filled with body lovin ingredients! This looks awesome. I never thought to roast veggies with a curry flavoring. Great idea! Can you suggest a substitute for the apple cider vinegar? I don’t generally keep it around. Also, to keep the salad fresher (for meal prep purposes), would it help if I kept the curry dressing in a jar and drizzled it over it just before eating? If so, would you suggest also doing that with the tahini dressing? You can just skip the ACV or sub it with lemon juice. And yes, store the dressing separate if storing for later!